There is no JTAG connector on the board. Instead, a pin header is connected to he UART via a RS232 level converter for boot mode programming. This suits me perfectly. I have all the tools I need and programming using the Python bootloader described in previous posts works just fine. My end application for this chip won’t have room for a standard JTAG header and I haven’t found anything to implement the serial wire debug yet. the processor supplied is the STM32F103RET6. This is a 64 pin device with all the standard stuff, some extra timers, 512k flash and 64k RAM. Should keep be happy for a bit. If you are a Windows user, the CD included with the board has a bunch of stuff and is enough to get you started writing code for it. Also in the box was a serial lead to connect a standard 9 pin serial port (or USB serial adaptor) to the pin header. All really very convenient. After a short period cutting and stripping wires, I was ready to start using my new toy. I really dislike the wiring-up part. It never looks neat when I have finished and it is always a relief to get that bit done. Just for now, it is connected to a few LEDs and one of my trusty Nokia LCD displays. First, things first: get a few lights blinking. Now, having access to all the pins makes it very easy to try out all the pin functions and see how things will work in the final application before getting too committed to the design. Pretty well straight away, I came across some issues to take note of. Firstly, one of the pins needed to make the processor run in the right boot mode is BOOT1. This happens to also be tasked as PB2. Once the processor has booted up, it can be used like any other GPIO pin but, when using the serial bootloader, or to boot from internal flash, it must be held at zero. the trouble here was that I was using a common-cathode 7 segment display connected to the lower 7 pins of port B. Consequently, PB2 and, therefore, BOOT1 are held high at reset and the bootloader cannot work. For now, I will disconnect the display when programming but a better solution will be to make sure that does not happen in an actual application. In this case, a common-anode display would have been a better choice. I have plenty of flashy light now. Next, time to get the LCD working. After I edit some code and compile and prog again,,, the j-link can’t connect to board…. But I use ulink it ok,,, I don’t know why? I am sorry – I don’t know enough about the J-Link to be able to offer any real help. I’m thinking it is problem when I want to re-download program via JTAG. It doesn’t work. I set BOOT0 to high and BOOT1 to low and then use Flash Loader from ST to download. did you use RS232 programmer to connect between pa9 pa10 and USB? Could you show what exactly you did with more details? ICSP is supposed to be the ultimate solution for those who disabled jtag by accident on JTAG programmer. 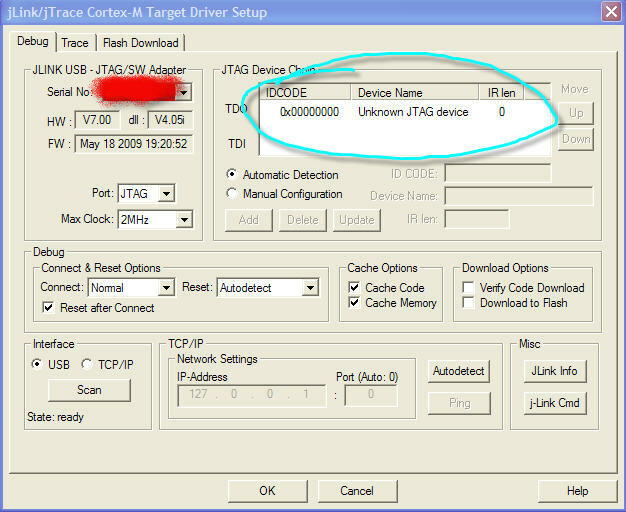 You can also try setting the processor into bootloader mode and then use the JTAG/SWD connection. That will prevent your remap code from running. Green, Thanks for your advice. Could you tell me more how to use ICSP? I coud revive it by using the entire 20pin JTAG adapter. Power off/reset or adding the nTRST pin did not work.